Nearly a quarter-century later, we might have expected fur to be relegated to the closet of shame alongside other controversial fashion accessories such as ivory earrings. Yet 73 per cent of this year's fashion shows in New York, Paris, Milan and London included fur. 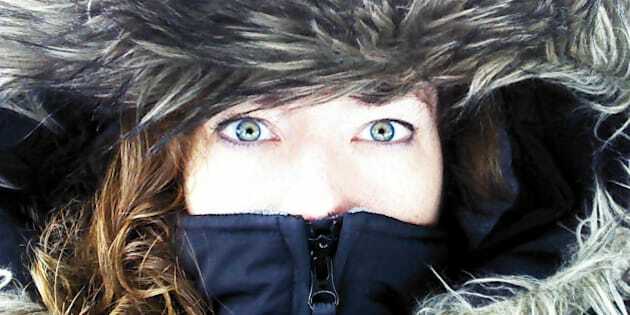 Close up of woman's face, focused on green eyes, zipped inside the hood of a large winter coat or parka, with a fur lining. Cold weather portrait. In 1996, an activist tossed a dead raccoon onto Vogue editor-in-chief Anna Wintour's plate. It was five years after the famous PETA spot showing fur-clad models striding down a catwalk in front of an enthusiastic audience. We all remember what happened next -- a drop of blood lands on a woman's face, and soon the entire crowd has been splattered as a model heads backstage, her coat leaving a sticky red trail behind her. Rather than falling into obsolescence, fur has found a new life trimming Canada Goose hoods, wrapping around Miley Cyrus at a year-end show, accenting handbags and appearing on Pippa Middleton's head. Fur has regained such popularity that sales have tripled since the 2000s. Although animal-rights organizations are putting out more and more campaigns, the message is being ignored by Lady Gaga, Madonna, Kanye West and their fans. Fur is worn guiltlessly, and even with pride. The industry has spared no effort in its mission to make fur acceptable and get it accepted, depicting it as eco-friendly, promising that the animals are treated humanely and launching competitions for young designers. With lavish advertising investments, it has made fur stand for a healthy and conscientious lifestyle. Karl Lagerfeld, who never goes anywhere without his cat Choupette (she has her own bedroom and two full-time servants), denies being insensitive to the plight of animals. This didn't stop him from designing an all-fur collection for Fendi. "I'm very sympathetic. I hate the idea of killing animals in a horrible way, but I think all that improved a lot," he explained to the New York Times. "I think a butcher shop is even worse... So I prefer not to know it." Case closed. Reading Lagerfeld's interview reminded me of the review of philosopher Aaron James's A**holes: A Theory that appeared in Nouveau Projet in 2013. It says that "assholes" are people who help themselves to special advantages that others do not have, and who are entrenched in a sense of entitlement that immunizes them against the complaints of their victims. Above all, "a**holes" feel completely within their right to do what they do. In a certain sense, Karl Lagerfeld, Kanye West and company are indeed "a**holes" -- they put their insatiable need for prestige before any and all moral considerations. After Tommy Hilfiger, Calvin Klein, Stella McCartney and several others, Hugo Boss has just joined the list of designers who are committed to cruelty-free fashion. But there will always be "a**holes" who prefer to turn a blind eye to the source of their fur. To put an end to the trails of blood on catwalks (and our city streets in the winter in the winter), we have to inform, educate and advocate. But we also need to use political leverage. It's not so Utopian to imagine Canada shutting down its fur farms, which supply two-thirds of our country's pelts. This has already happened in Scotland, the UK, Belgium and a few states in Austria, and is soon to come in the Netherlands. Canada has only 233 mink farms and some 50 fox farms -- the jobs at stake don't number in the thousands. The good news is that our fellow citizens are willing to see this barbarian practice come to an end. A recent survey conducted for HSI-Canada showed that 68 per cent of all Canadians agree with the idea of banning fur farms. We just need a bit of political courage. This blog post originally appeared inVersus, magazine végane. Translation: Elisabeth Lyman.